Giving a Daum gift is giving colour, light, beauty and rarity as all pieces are by their very essence unique. The Daum factory presents its crystal collection. Vases, bowls, art editions, perfume bottles, discover the Daum online store. CRYSTAL DAUM – DAUM CRYSTAL FRANCE, Giving a Daum gift is giving colour, light, beauty and rarity as all pieces are by their very essence unique. The Daum adventure is an extraordinary story of creativity, which, over the decades, has embarked the House on an artistic adventure in permanent renewal. The House of Daum was founded in 1878, and was rapidly riding the artistic wave of the Ecole de Nancy. It opened itself to all the innovative glassmaking techniques of that era, which enable it to reach the peaks of creativity at the sides of its peer, Emile Gallé. Daum was rapidly recognised as an essential milestone in the prodigious adventure of Art Nouveau. The Universal Exhibition of 1900 awarded Daum a Grand Prix and brought it international renown. Always innovative, Daum had already cloaked electric light with glass, in association with major artists of the period, like Majorelle and Henry Bergé. As of the mid-1920s, attitudes and tastes changed, the wheel of the creative adventure turned and Daum gradually left the shores of Art Nouveau to approach those of the nascent Art Deco movement. Daum produced pieces in this new style which rank among the most beautiful in the entire Daum collection, with a richness of proposals, an accuracy of design and a sublimation of the materials. Glass took on a mineral, frosted and crystallised aspect. Bevels were arranged in a cubist spirit, planes cut deep into the glass resolutely shook old habits. The inimitable know-how of these craftsmen and their trade secrets, the fruit of a patient daily learning process, made all the difference. The Nancy crystalware was founded in 1878 by Jean Daum. In 1891, his son Antonin opened an art department, the starting point of unique, world-renowned creations. The first vases were decorated with finely cut colorful flowers, precursors to what was to become the “Art nouveau” style. The workshops mastered different techniques for bottle-making, among which molten glass, acid or wheel engraving, glass painting, or the use of three-layered glass which made it possible to shade colors. The Daum family multiplied inventions and patents, and was the first to embellish electric lights with glass, working with period artists such as Majorelle or Henri Bergé. The glass factory was consecrated during the Universal Exhibition in Paris in 1900, winning the first Grand Prix for glass art. In 1920, Paul Daum led the company to make pieces with totally new aesthetics, ushering in the “Art déco” style, as it was recognized during the Exposition Internationale des Arts Décoratifs in 1925. During that period, glass took on a mineral aspect. It was frosted, crystallized or deeply etched, in the spirit of the Cubist movement. In the same way as for Art nouveau, Daum became a reference for excellence with its creations for the new movement called Art déco. The year 1934 was an important turning point in the history of the Lorraine glass factory: the addition of lead to the glass composition produced light and thick Daum crystal. Daum was selected to create the table service for the Normandie ocean liner. The new material gradually replaced glass, offering creators new possibilities. The hot crystal was worked in the workshop, drawn and contorted to obtain organic shaped pieces that are so characteristic of the 50s. Daum has earned a reputation of excellence throughout the world thanks to the company’s mastery of working with pâte de cristal. Each Daum creation is a unique work of art, recognized for its purity, the very special manner in which it catches the most minute variations of light, the intensity of the flamboyant colors and its harmonious lines. 1878 – Jean Daum creates the Nancy crystalware. 1900 – Daum receives the Grand Prix at the Universal Exhibition in Paris, bringing world fame to the crystal maker and notoriety for its role in the “Art nouveau” movement. 1920 – Daum is one of the leader in the “Art déco” movement. Some of its pieces become part of the collections in the world’s most prestigious museums. 1934 – Daum replaces glass with crystal and devotes itself to decorative pieces and tableware in transparent crystal. The crystalware is selected to create the table service for the Normandie ocean liner. 1968 – Daum develops the “lost wax” technique that uses pâte de cristal. Since its foundation in 1878, Daum has always expanded its collection through exchange and partnership with the world of art. Thus, from the beginning of the company’s floral creations in the Art nouveau mouvement, Antonin Daum created an Art department in 1893. In 1901, the École de Nancy opened its doors to become the spearhead that would evolve into Germany’s Jugendstil. The Art déco years followed, during which shapes became more simple, tending towards the abstract. When the crystal company owner from Nancy met Dali in 1968 at his home in Cadaquès, forming a friendship with the surrealist artist that would produce many original creations that are presented in this exhibition. Finally recently, artworks by Braque as well as collections from the Guimet and Cernuschi museums were reinterpreted by these masters of crystal. More than three hundred and fifty artists have worked with Daum, each with very different styles. Daum’s creative force is its ability to combine an artist’s unique personal aesthetics with traditional expertise. From the concept artist Ben to Dali, the surrealist, from Etienne’s symbolism to Jérôme Mesnager’s urban art, from the Trojan horse revisited by Carlos Mata, to Alain Séchas green nymph. Daum succeeds in the challenge to unite artists from different universes. The extreme plasticity of pâte de cristal and its almost immemorial character make this millennial technique a true link between cultures. Thus, in modernizing the ancient craftsmanship, Daum also offered artists from the 20th century the opportunity to become timeless. The crystal maker’s strength lies in its ability to combine the tradition of craft with the modernity of the 20th century, by working with iconic artists such as Dali, Arman, César, Ben and Jérôme Mesnager. The partnerships have been mutually enriching for both the artists as well as the craftsmen. Thus, Ben’s letters no longer resemble austere chalkboard writing but become a soft textured, colorful piece. César’s thumb also reminds one of a primitive totem with mysterious powers. However, these creations are also genuine technical challenges for the crystal company and its teams, pushing them to constantly renew their way of working with pâte de cristal. More than 350 artistic collaborations are available online, with many advantages: Free shipping, gift cart validation, loyalty points, and responsive customer service. The visitor will be able to discover the Daum glassware collection, presented as a scenography. More than 100 years of manufacturing history in a unique place. More than 140 exhibits, thanks to a financial effort from the city, the region, and the Ministry of Culture, in order to preserve in Lorraine this collection witness of its recent past. A heritage that should therefore be kept to the public of Lorrain. 5 generations of Glass Masters who have succeeded each other so that their various creations reach an international reputation. The ground floor room of the Nancy Museum of Fine Arts presents the Daum collection. The works are arranged in chronological order, no date, no order number disturbs the visitor’s vision. The sound of the room allows showcasing all the styles of the line. The oldest pieces of the collection date from 1890, the latest are more recent. This exhibition should not make us forget that Daum is also an industry. An industry that knows some difficulties, but Americans and Asians remain very fond of Lorraine production. An additional reason to appreciate these artistic jewels which unfortunately, could have ended on the shelves of a rich Japanese collector. Each of the pieces exiting the factory is stamped the Daum France signature. How to authenticate and recognize a real Daum crystal? The signature of the Daum pieces has evolved over time … The “Daum” or “Daum France” signatures are identical and authenticate all our pieces of first choice. The “Daum Nancy” signatures are affixed to the second-choice pieces, which therefore contain defects; thus the prices are lower! We also find signatures like “Nancy + the year of manufacture of the piece”. It’s also the second choice. Not in accordance with the Daum France quality standard. All the articles present on our website include the Daum France signature. French contemporary artist, Richard Orlinski sculpts to sublimate reality and to create lively and timeless masterpieces. His works, designed around the Born Wild concept are evidence of essential values in a resolutely contemporary style, which never gives in to trash, in to extravagance or in to short-lived. According to him, the panther is a symbol of mystery, feminity and sensuality. It expresses a wild power, speed and ferocity. Cut in facets like a diamond, the panther is impressive by its size and its allure so close to reality. French painter and sculptor, Marie-Paule Deville-Chabrolle pays tribute to feminity. For Daum, she creates L’hiver en soi. Very elegant and fragile, this woman draped in an harmonious way delicately transports us to our winter thoughts. Famous French painter and sculptor, Jean-Philippe Richard has taken the women as predilection subject. His pieces are delicate and graceful. His women have slender sensual forms. 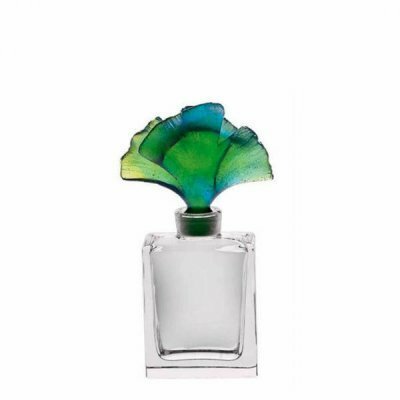 Considered as the most artistic shapes designers, Serge Mansau creates a new generation of perfume bottles for the Haute Couture houses, with lots of poetry and sophistication. Sculptor, filmmaker and scenographer, he sees the world through children’s eyes. For Daum, he creates one large Doudours and four little Doudours inviting us to the journey of our most tender moments: those of our childhood.